Will it happen? 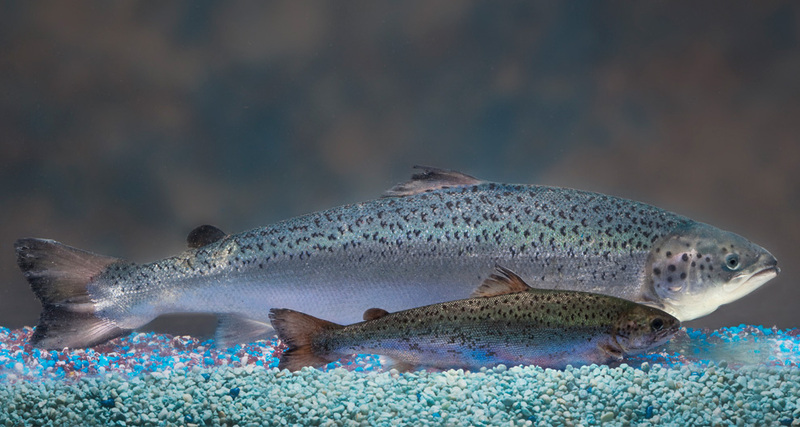 Will the king of fish, the noble, glamorous salmon become another commercially-available genetically modified (GM) species? And if so, will you eat it? The GM salmon grows twice as fast as its wild relative. Its genes have been artificially modified to include DNA from the Pacific Chinook and from an eel-like species so that the resulting fish keeps growing all year long. AquaBounty Technologies, the Massachusetts company behind the project, has waited over ten years for this. 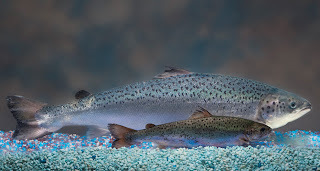 On Monday, the FDA held a public consultation on how to label the GM salmon so that the public is aware of what kind of fish it will be buying. A detailed scientific review didn’t find anything detrimental to human health or to the environment. It seems to be just a matter of time before we can buy GM salmon in the supermarket. Critics fear that if the GM salmon escapes the confines of their farms, they may breed with wild salmon causing havoc in the natural food chain. Salmon feeds an enormous variety of animals, from humans to grizzly bears and eagles. Those fears are unfounded. The farms are inland, far from river ways. And even if they do escape or are placed in wild waters (ecoterrorism? ), the GM salmon won’t interbreed since its eggs have been designed to develop into sterile females. So, no GM offspring is possible. Hard not to think of Mary Shelley’s Frankenstein when reading about what goes on with the popular reaction to any GM species. Sure, scientists are not awakening the dead or piecing together monsters with parts of dead bodies. But we are at the point where we can tweak life into different shapes and forms. The secret turned out to be biochemistry, not electricity. At their core, however, the fears remain the same almost 200 years later. In the gothic novel, the monster asks his creator for a companion. Terrified that he would help create a race of monstrous (and powerful) beings that could end up destroying humanity, Dr. Frankenstein refuses. The moral of the story is simple: some things are better off left for God. Is that the case with genetic engineering? Absolutely not. In our days, the battle is focused on the FDA ruling on GM foods. In the case of GM salmon, the expectation is that they will go ahead and approve it. After all, the FDA allows us to eat cloned cattle, pigs, and goats. The enormous pressure commercial fisheries are suffering, coupled to the increase in global population and its appetite for high quality fish and meat, should be an encouragement to boost the production of salmon through science. Genetically engineered foods are a far cry from a sci-fi nightmare, although of course all possible precautions should be taken before a new product is launched into the marketplace or the environment. There is, however, a potential problem. GM or not, all fish raised in captivity still need to eat. In the case of salmon, bass, tuna, and cod, all carnivore species, they consume a large amount of fish. So, oceans and rivers keep being overfished in order to feed our “aquatic cattle.” Possibly, as Paul Greenberg suggested in his book Four Fish , we should be changing our eating habits and start consuming more tilapia (a vegetarian fish) and artic char, which has a smaller environmental impact. In any case, GM foods won’t go away. As with any discovery in science, once you open the box you can’t close it again. Better to be smart about it and make sure the science is solid so as to guarantee that these FDA rulings stand on solid ground. So far, all seems well.